Equating an enemy with Hitler is hazardous business, distorting perception and setting reason aflame. Yet with Saddam Hussein the temptation is nearly irresistible. He blithely knocks off rivals, gasses Kurdish children, launches rockets against big cities. He murders a neighboring country, then makes himself the record-breaking hostage taker of our day. At times in the gulf confrontation, Saddam has played the dumb thug to a T. He made a video of himself petting the head of a small, petrified boy, one of his captives. He recklessly provoked France by violating its embassy in Kuwait City, prompting an incensed Paris to double its troop strength in the gulf. Given the chance to address the American people, he badly miscued, unleashing an insufferably long, rambling diatribe. Such blunders testify to the limits of the man's sophistication. Scarcely traveled, haphazardly educated, counseled only by sycophants, Saddam was stunned to learn this summer that in America there is no penalty  let alone the mandatory death prescribed in Iraq  for criticizing the nation's President. 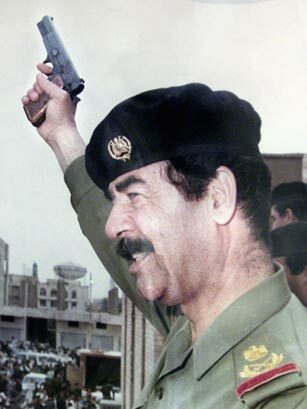 Desert bumpkin though he may be, Saddam has played the gulf game with an ugly finesse. He released the transcript of his preinvasion chat with a courtierly April Glaspie, humiliating the U.S. ambassador and the government she represents by publicizing her unctuous comments. He set hostages free in ; dribs and drabs, enticing a parade of foreign has-beens and wannabes to his door. Then, recognizing finally that his "human shields" offered him no real protection, he dismissed them all, portraying himself, however dishonestly, as amenable to reason. Saddam may yet complicate life for George Bush by staging a partial withdrawal, crippling (perhaps fatally) the resolve of the alliance arrayed against him. Artfully exploiting the Arab psyche, Iraq's "Father-Leader" managed to muddy a clear-cut case of avaricious land gobbling by convincing millions of fellow Arabs that the real issue was Israel's intransigence, or the haves and have-nots of the Middle East, or the imperialism of the West. By exciting Arab resentment, Saddam raised the stakes for his opponents, threatening the West with terrorism and neighboring regimes with unrest. If it comes to war, Saddam may end up losing in the skies over Iraq but prevailing as a hero on the streets of Cairo, Damascus and Amman. Yet Saddam has no death wish. He has survived an enfilade of 10 assassination attempts, and was constantly moving his sleeping quarters long before he antagonized any superpower. He once told another Arab ruler, "If I am killed, there will be no part of me left bigger than the tip of my finger." A man who knows such things can be counted on to employ every last drop of cunning for the task of staying alive  and on top.